Homeowners considering a custom pool installation will undoubtedly have an easier time and more available options if they are lucky enough to have a relatively flat and spacious property. However, it has come to our attention that many homeowners without the ideal yard don’t understand that they have options, too. As your Dallas pool builders, we want to assure you that we can get very creative when it comes to building pools in tight, awkward, sloping, hilly or otherwise challenging spaces. First and foremost, we always reassure our clients that the safety and stability of your new pool comes before everything else we do. As long as we can ensure a secure build, we can give you a pool almost anywhere. The first step in our custom process (after consulting with you and drawing up detailed plans and a schedule) is to ensure that we are the pool builders Dallas homeowners can count on for detailed ground-prep work. This step is absolutely crucial to the overall success and outcome of any swimming pool build, and it grows even more important with each degree of difficulty that a lot presents us with. What Kind of Swimming Pool Solutions are Available for My Unique Property? Yards that slope steeply away from the home – This is probably the ideal “problem backyard” to have. We will create the appropriate amount of grading into your sloped property so that your custom pool will be level. This type of yard allows for the installation of the popular “infinity pool” design. Some homeowners also choose to go with multi-level pools for that “spill-over” effect. Yards that slope steeply toward the home – While not as ideal as a yard that slopes away from the home, a steep yard in the direction of the home can be excavated and graded so that a pool will sit nicely amongst a retaining wall. This situation often allows us to install breathtaking waterfalls or cascades down the natural slope of the yard using rocks and a booster water pump. Tight spaces (typically in urban areas) – Oftentimes, homeowners think that they’ll have to give up their dream of owning a swimming pool to take advantage of everything that city living has to offer. 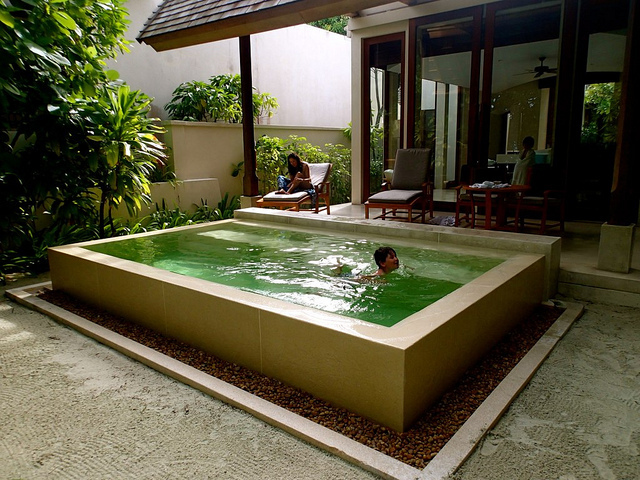 As long as your city code allows, we can build you a cast concrete plunge pool that is very refreshing! Another option is to place a small in-ground pool directly against the exterior of your house. In-ground lap pools and small plunge pools that run along the exterior of a yard can also be great options for tight locations. When a home backs directly into a hillside – Even more challenging than a sloped property is one that is essentially a hillside. Some homes are even built into hillsides. In cases like these, we essentially remove a chunk of the hillside and strengthen the dug-out area with concrete walls connected directly to the back of the home. This often limits the size of the pool we can build, but it doesn’t limit how stunning it will look!